Every now and then one should read a book. Ok ereading a book is also fine 😉 If you are curious about InfoPath then this book is for you. 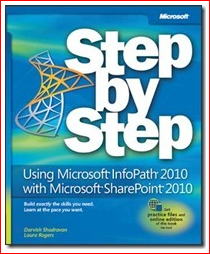 Teaching you about how to use InfoPath and publishing your form to SharePoint 2010. Yep for starters this is a great book! This entry was posted in Books, InfoPath on October 31, 2011 by Maurice.